In our devotions so far, we have examined the meaning and importance of the words our heavenly Father. They describe the Divine Person we pray to and hint at his character and absolute power. We pray to such a God because he is willing and able to answer us. But what should we ask for first? Too often, we begin our prayers with a perfunctory nod to God and then immediately get down to more important business, namely, ourselves. Such prayers are exercises in sinfulness. In order to experience God through prayer and develop a mature spirituality, we must get over ourselves and focus on him. Consider the analogy of two young lovers. How far along the path to marriage do you think a man will get if, at the outset of every day, he talks incessantly about himself, never letting the woman get a word in edgewise? (Or vice versa?) Not far along at all! Everyday human conversation begins with a question—“How are you?”—precisely so we can get to know the other person better. A similar dynamic is at work in prayer. Our first request of God should be to know him better. And that, in fact, is what Jesus teaches our first petition is when he prays, “hallowed be your name” (Matt. 6:9). Think, again, of the young lovers. You remember being in love, don’t you? It was—and hopefully still is—a marvelous experience. The amazing thing about it, however, is its near total selflessness. All you think about is the other person. All you care about is the other person. All your time, talent, and treasure go to making the other person happy. Love is the most selfless thing we do, whether the object of our affection is another human or God. Even more amazingly, however, that selflessness turns out to be self-fulfilling. The young man who puts his girlfriend’s interests ahead of his own finds the happiness he seeks when she agrees to marry him. Spiritually speaking, “whoever loses his life for my sake will find it,” as Jesus said (Matt. 10:39). When we seek God’s kingdom first, we discover that he wants to meet all our other needs (Matt. 6:33). So, when you pray, focus on God; you will discover his powerful love—for you! God is our heavenly Father. He created us, saved us, and provides for our needs. So, when we pray, we ought to remember and give thanks for his powerful love. Second, in light of the unreliability of our emotions, we should let facts determine our feelings. God’s Word is the most reliable source of information we have about him, so what it says about him should determine how we feel about him, especially when we go through difficult circumstances. Consider the logic of Jesus’ words in Matthew 6:25–27: “Therefore I tell you, do not worry about your life, what you will eat or drink; or about your body, what you will wear. Is not life more important than food, and the body more important than clothes? Look at the birds of the air; they do not sow or reap or store away in barns, and yet your heavenly Father feeds them. Are you not much more valuable than they? Who of you by worrying can add a single hour to his life?” Jesus replied to his audience’s anxiety by noting two facts: (1) God cares for you more than birds, whose needs are always met; and (2) anxiety is unhelpful. Jesus let those facts shape his emotional life, and he encouraged his followers to do the same. Third, and finally, we should walk by faith. St. John of the Cross wrote about “the dark night of the soul,” when we do not feel God’s presence or comfort at all. Interestingly, he considered such a night a gift from God. When life is going well and our emotions are all positive ones, it is easy to believe in God and do his will. But take those crutches away, and will any faith in him remain? Are we fair-weather friends to God? Do we love God for God, or selfishly? Faith is not a leap in the dark. It is not a belief in the bizarre or absurd. It is the simple trust that God can be taken at his word. God loves you powerfully. That is a fact whether you feel it or not. Have faith, and one day—if not today—the facts and your feelings will meet, and you will see God “face to face” (1 Cor. 13:12). 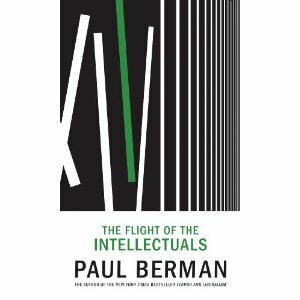 Paul Berman, The Flight of the Intellectuals (Brooklyn, NY: Melville House, 2010). $26.00, 304 pages. On February 14, 1989, Ayatollah Ruhollah Khomeini issued a fatwa—or legal ruling—against Salman Rushdie, sentencing him to death in absentia for the crime of writing a novel that slandered the Prophet Muhammad. The issuance of the fatwa was taken seriously enough by Rushdie himself and by British authorities that he went into hiding under their protection for several years afterward. The ayatollah has since died, but his fatwa remains in force. In the years since then, as Paul Berman points out in The Flight of the Intellectuals, Salman Rushdie “has metastasized into an entire social class” who live under protection of police or private security because they have in some way offended Muslims with their words. The class includes Ayaan Hirsi Ali, Ibn Warraq, Bassam Tibi, Magdi Allam, Fiamma Nierenstein, Caroline Fourest, Robert Redeker, Flemming Rose, Kurt Westergaard, and Boualem Sansal, among many others. Intellectuals rushed to Rushdie’s defense in 1989. Some, like Berman himself, do the same for today’s Rushdie class. But others—particularly liberal intellectuals with whose politics Berman agrees and from whom he expects greater resistance to Islamic fascism—find themselves cooing over Islamic “moderates” who are anything but, even as they insinuate the worst about Islamism’s greatest critiques, writers such as Hirsi Ali. The Flight of the Intellectuals is a case study in liberal tergiversation, focusing on the disparate treatment Tariq Ramadan and Ayaan Hirsi Ali have received at the hands of Ian Buruma and other liberal intellectuals. Tariq Ramadan is the best-known face of moderate Islam in the West. Raised in Geneva and a philosopher, Ramadan has written several books seeking a rapprochement between Islam and the West. He is also the grandson of Hassan al-Banna, founder of the Muslim Brotherhood in Egypt. Relying on the work of Jeffrey Herf and other historians, Berman demonstrates the deep connections between al-Banna, his allies, and Nazism in World War II. Moreover, he points out that the Brotherhood’s chief ideologues—al-Banna himself and Sayyid Qutb—were vicious anti-Semites, not to mention complicit in providing theological warrants for Nazi acts of political violence. In other words, objectively speaking, Islamism has fascist streams flowing into it. Is this history important? Is Ramadan guilty of the sins of his grandfather? Yes, and no. Berman critiques Ramadan because he consistently and persistently elides and obfuscates the very past in which his own family plays such an important role. Not only that, and history aside, he consistently and persistently supports the theological writings of Sheikh Yusuf al-Qaradawi, whom Berman dubs “the mufti of martyrdom operations,” i.e., suicide bombings. Berman wonders whether Ramadan, with his elision, obfuscation, and unwavering support of Qaradawi, can be justifiably considered a moderate. What Berman wonders is why intellectuals such as Ian Buruma and Timothy Garton Ash—men whose liberal bona fides are unquestioned—give cover to Ramadan, even as they critique Ayaan Hirsi Ali, a critic of the brutal treatment meted out to women by the ideologues and practitioners of Islamism. Truth be told, Hirsi Ali believes the fault lies with Islam itself, not just modern political permutations of it. Ash referred to Hirsi Ali as an “Enlightenment fundamentalist” because of atheistic rationalism and searing critique of Islam, a description he later retracted. But who in their right mind, Berman asks, would equate Muslim fundamentalism, which in its political form issues death sentences against writers, with political liberals who wish to see freedom of choice in religion and other matters extend globally to all individuals? Issuing death threats and receiving death threats are not morally equivalent acts, but that seems to be what they have become in the eyes of some liberal intellectuals. And thus the book ends, prompting a question: How shall we, its readers, respond to the challenge of Islamism? With clarity and courage, or with obfuscation and compromise? The flight of the intellectuals results from choosing the latter response. In this book vlog, I talk about four books that I’m reading. I also give away five books at part of the 10 Weeks of Free Books contest. Check back to this blog next Tuesday at 2:00 p.m. (CDT) for a list of books that will be given away the following Thursday. Mark Shaw, Global Awakening: How 20th-Century Revivals Triggered a Christian Revolution (Downers Grove, IL: IVP Academic, 2010). John Dickson, The Best Kept Secret of Christian Mission: Promoting the Gospel with More Than Our Lips (Grand Rapids, MI: Zondervan, 2010). Gary B. McGee, Miracles, Missions and American Pentecostalism (Maryknoll, NY: Orbis, 2010). Paul Berman, The Flight of the Intellectuals (Brooklyn, NY: Melville House, 2010). Congratulations to the following AG ministers! The books are in the mail. William Otley: Christians at the Border by M. Daniel Carroll R.
A third and final reason we call God Father is that he is the Creator of and Provider for the entire world. James describes him as “the Father of the heavenly lights” (James 1:17). Paul writes, “there is but one God, the Father, from whom all things came and for whom we live; and there is but one Lord, Jesus Christ, through whom all things came and through whom we live” (1 Cor. 8:6). No wonder, then, he writes, “his whole family [literally, ‘all fatherhood’] in heaven and on earth derives its name” from the heavenly Father (Eph. 3:15). Or that, quoting a Greek poet, he remarks: “We are his offspring” (Acts 17:28). God created and provides for us; therefore, he is our Father. As Creator and Provider, the Father dispenses his blessing with impartiality and expects us to do the same. In the Sermon on the Mount, Jesus says, “But I tell you: Love your enemies and pray for those who persecute you, that you may be sons of your Father in heaven. He causes his sun to rise on the evil and the good, and sends rain on the righteous and the unrighteous” (Matt. 5:44–45). When it comes to the blessings of salvation and eternal life with him, God requires faith of us. With creature comforts and temporal goods, however, God is an equal-opportunity giver. First, “Is not life more important than food, and the body more important than clothes?” When we pray, God reminds us of our priorities and helps us see the difference between our needs and our wants. God is the Father of the entire world. He created us; he will also provide for us. So, let us pray to him! The first reason we call God Father is because he is “the God and Father of our Lord Jesus Christ” (Eph. 1:3). The second reason is that he is the Father of all believers. Jesus had a unique relationship with God, but we can have a relationship with him too, although in a different way. That difference can be expressed as the difference between a natural-born and an adopted child: Jesus is God’s natural Son, but we are God’s adopted sons and daughters. As a natural Son, Jesus shares the Father’s DNA. He is divine by nature. We, on the other hand, do not share the Father’s DNA—we are not divine—but he invites us to enter a relationship with him, a relationship of his choosing. If you think about it, the adoption analogy is a vivid picture of the gospel. Because of sin, we are orphans. Precisely because we are orphans, however, God has no parental duties toward us. We are someone else’s children, someone else’s problem. But chooses to adopt us anyway. It is his “pleasure and will” to do so. Like all adoptions, the cost to the would-be parent is exorbitant. We become God’s sons and daughters “through Jesus Christ,” that is, by means of his death and resurrection. But God is willing to pay the cost because he loves us. What difference does this change in status from slavery to sonship make for our prayer life? Listen to Romans 8:15–17a: “For you did not receive a spirit that makes you a slave again to fear, but you received the Spirit of sonship. 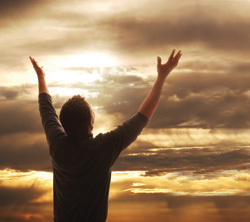 And by him we cry, ‘Abba, Father.’ The Spirit himself testifies with our spirit that we are God’s children. Now if we are children, then we are heirs—heirs of God and co-heirs with Christ.” As God’s children and heirs, we can joyfully ask him for anything we need. He chose to love us in the first place. Will he not also care for us on an ongoing basis? Ten Weeks of Free Books! MinistryDirect.com and Gospel Publishing House are giving away free books every week through the end of September. Check out George Paul Wood’s blog every Tuesday at 2:00 p.m. (Central Daylight Time) for the list of books and contest rules. Then, come back to his blog on every Thursday at 10:00 a.m. (CDT) for a video announcement of winners and discussion of new and interesting books. Eligibility: Contestants must be credentialed Assemblies of God ministers and subscribers to MinistryDirect.com. Subscription to MinistryDirect.com is free for all credentialed AG ministers. (If you have questions about your subscription, please email questions@ministrydirect.com.) For some books, eligibility may be further limited, for example, to senior pastors, youth pastors, children’s pastors, worship pastors, etc.). Employees of the General Council are ineligible for this contest. Entry and Winning: Eligible contestants must email George Paul Wood at gpwood@ag.org before Thursday at 9:00 a.m. CDT. Their emails should include the following information: (1) Name, (2) Contact info, and (3) order of preference for books being given away that week. Books will be given away in order of name drawn and highest book preference still available. Promise and Promotion: Contestants who win a book promise to read and post of review of it on their MinistryDirect.com blog within 30 days of receiving it. MinistryDirect.com will promote the book reviews within MinistryDirect.com itself and also on Twitter and Facebook. Multiple Wins: Winning contestants are eligible to re-enter the contest only after they have read and reviewed already won books on their MinistryDirect.com blog. Author georgepwoodPosted on July 27, 2010 July 27, 2010 Categories Book Vlog, MinistryDirectLeave a comment on Ten Weeks of Free Books!